These are from Risa in Ecuador. 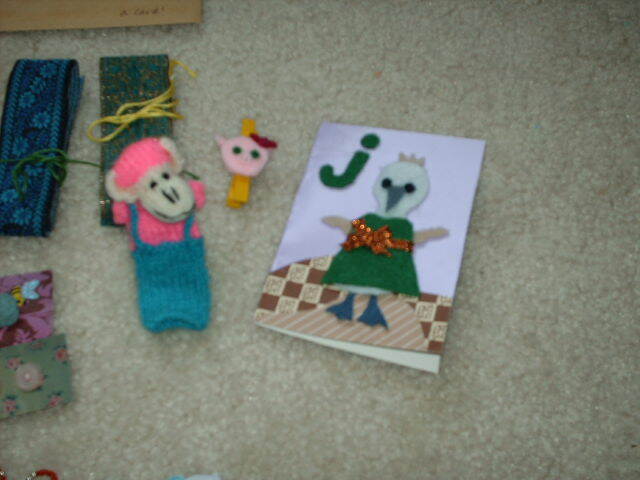 Notice the cute monkey finger puppet and handmade card. The beads are what the indigenous women wear - it's very long, can wrap around your wrist as a cuff or wear as a necklace. Some of the items were individually packaged and had a written explanation of what's inside. The piggy clothespin is too cute! Risa asked for vintage craft supplies and such and just want to kick myself as I didn't take a picture of the stuff I sent to her because I was in hurry to mail out, so I hope she takes a picture and posts it on her blog. They were vintage fabric, trim, buttons, handmade felt item (can't remember what it was), some postcards of Denver and Colorado, and more stuff of which I can't recall. After I mailed this out, I found a felt bottlecap pincushion I made for her on the floor under my craft desk which must have dropped when I was hurriedly wrapping and packaging before the last mail pick up. So Risa if you read this, expect another small package soon. 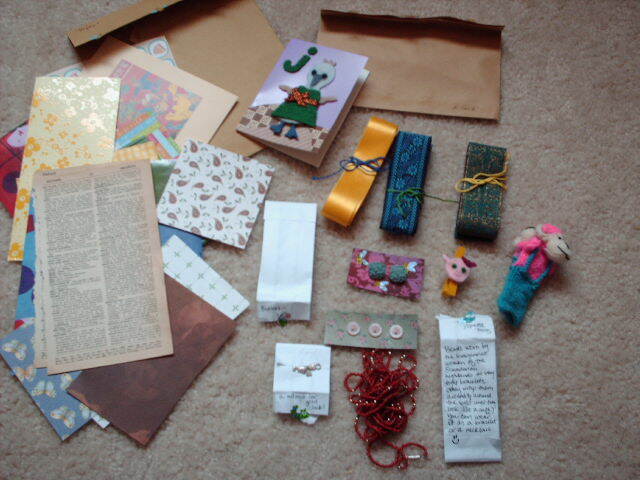 This swap is from Tania from Portugal. 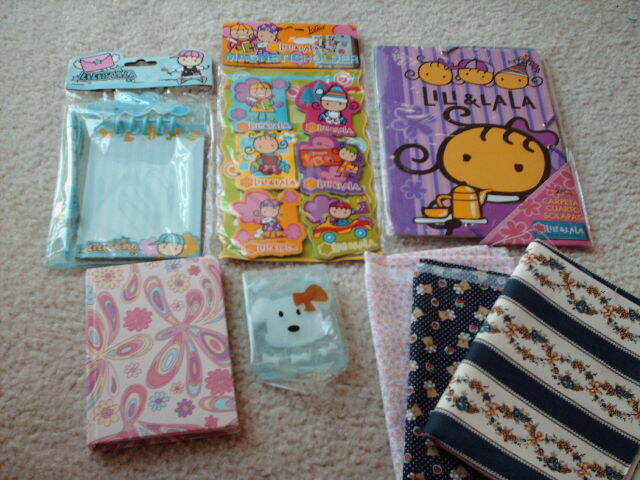 I first saw the Lili & Lala stuff on Flickr that she sent to someone on another swap and since I like cute Kawaii stuff like Hello Kitty and Pucca, I asked her if we can do a personal swap. So she sent me these along with some Portuguese fabric and fat quarters. 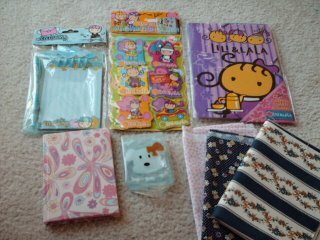 I especially like the teddy bear and strawberry dark blue fabric. I sent her some fat quarters, vintage ribbon and trim, a handmade felt bottlecap pincushion, some postcards, and more. And also like Risa, I didn't take a picture of these either as I was in a hurry to mail out and hope she posts pics on her blog, too. Also, check out Flickr's Coloriffic Swap-o-rama swap - the colors for July are chocolate brown and baby blue. Jewel from NY, NY was my swap partner and among the stuff she sent me were beautiful turquoise and tiger eye necklace and earrings, and of course, a Dove milk chocolate candy bar. Blogger was bugging out on me so wasn't able to upload this picture but you can see the pic on the link above. I swapped with a Chantal from the Netherlands which I also didn't take a picture of because I was trying to beat the deadline and ended up getting by the skin of my teeth on the last day (why do I always forget to take a pic of what I sent out?!*&@!) but hopefully she'll upload a picture to Flickr. 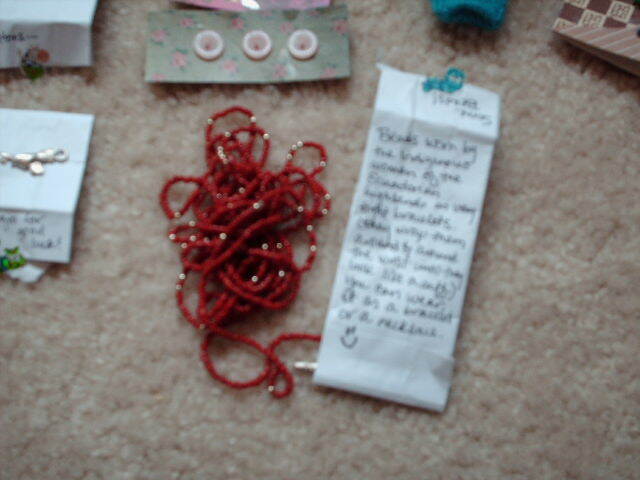 Among the stuff I sent her were two handmade blue jeans pins with felt designs and ribbon and some beads and fabric. I hope she likes what I sent her. Someday we have to make a swap. I am quickly becoming addicted to swaps! I just signed up for a few - i've only done one before, but now i'm in three! And maybe more than that. YAY! I'm quite excited by the thought of it, really. very cute!!! risa sends some pretty neat things- i am forever wearing that necklace and ramel is always swooning over it- hahaha!